Thanks to long time Rewards Canada reader Kevin A. for forwarding the details on the merger! Earlier this year there was big news that Marriott Hotels purchased our homegrown Delta Hotels brand. The big question at the time was not if but when would Delta integrate into Marriott Rewards. Well now we know the answer and its real soon! As of June 18th Marriott Rewards becomes the official loyalty program for Delta Hotels. Find all the details on Marriott's site here. Delta Privilege members will continue to receive all their regular entitled benefits until February 2016 and if you are a Marriott Rewards member here is what you will enjoy as well. The merger sees limited Marriott Rewards capacity until Delta is fully integrated into Marriott's systems. So what this means is that from June 18, 15 to early 2016 Marriott Rewards members will not be able to earn or redeem points or status credits for Delta stays but you will still be able to earn 500 Aeroplan miles for stays until early 2016. If you are an elite member with Marriott Rewards you will however enjoy your elite benefits on Delta Hotel stays starting on June 18th! Read all about the merger of Delta Hotels Privilege into Marriott Rewards here. Ultimately it will be sad to see Delta Privilege disappearing as it was a very giving program in terms of the benefits given to its Elite members such as hotel credits and free upgrades but the trade off will now be those stays at Delta Hotels getting you potential free nights and elite benefits to use at hotels around the globe. What are your thoughts on this iconic Canadian hotel loyalty program disappearing? I'm confused by how Marriott/Delta are positioning this change. So eff. 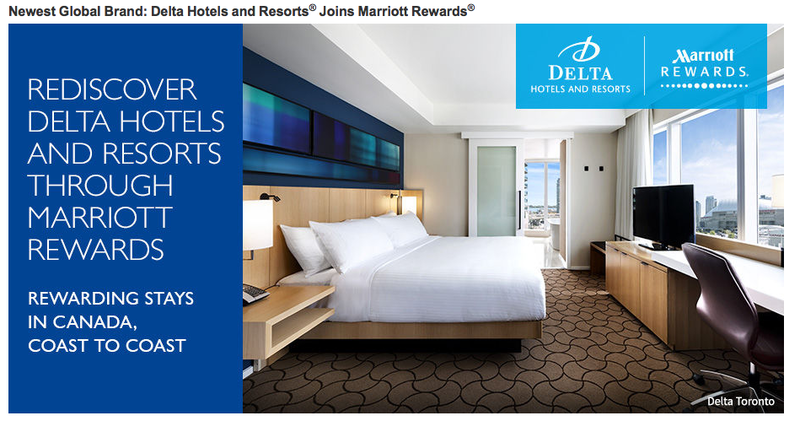 18Jun15, Marriott Rewards becomes the official Rewards programme of Delta Hotels & Resorts, but Marriott Rewards members won't earn points, miles or Elite night credits for stays and will not be able to redeem points toward free stays at Delta Hotels and Resorts. So does that mean my Delta Privilege account continues to earn points, miles etc...and that those points will all eventually be merged into a Marriott Rewards programme in early 2016?